If you have leftover rice, this would be a great dish to use it up in. I added crumbled Italian sausage for some heartiness but you can easily omit the sausage and use vegetable stock for a vegetarian or meatless meal. These were even good the day after when the flavors really were absorbed by the rice. So if you're trying to incorporate more vegetables in your diet this year, give this one a try! Pour the tomatoes into a large bowl and break apart using a pair of kitchen shears or your finger tips. Add the zucchini, cooked sausage, cheese, olive oil, garlic, salt, and pepper. Stir to combine. Stir the cooked rice into the vegetable mix to combine. Warm the chicken broth and set aside. Spoon the rice mixture into the peppers. Place the peppers in a deep baking dish and fill dish with the warm chicken broth. Cover the dish with foil and bake for 45 minutes. 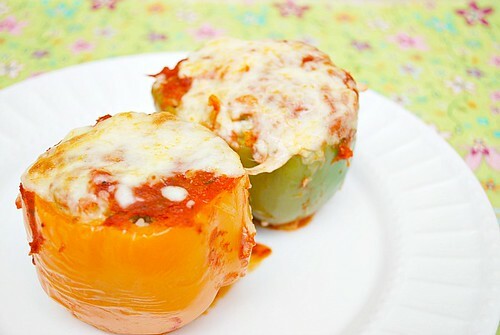 Remove the foil, sprinkle the top of each pepper with cheese and continue baking until the cheese is golden, about 15 minutes. 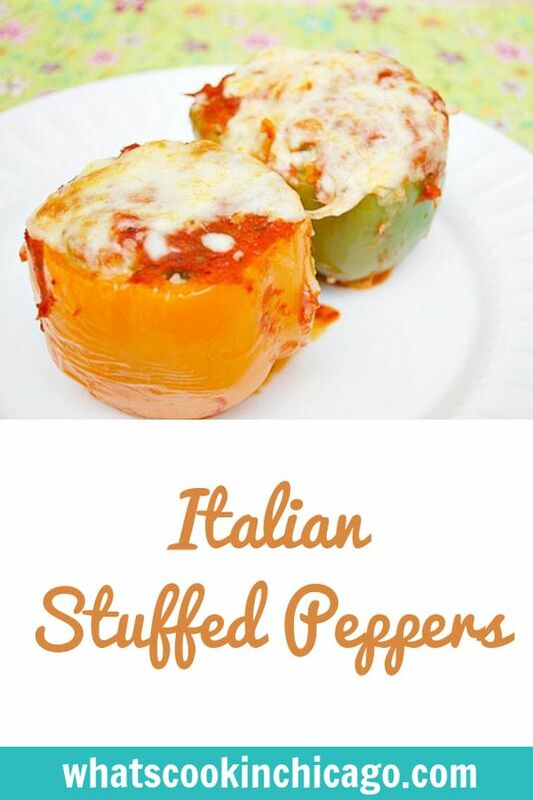 Remove from the oven, carefully transfer the stuffed pepper to a serving plate. Looks like you forgot to list chicken broth and the quantity in the ingredients. The peppers look really yummy!